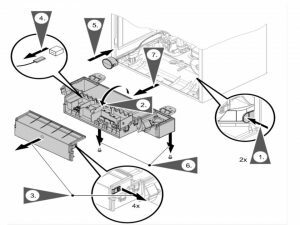 Welcome to troubleshooting part of Viessmann Boilers Guide. 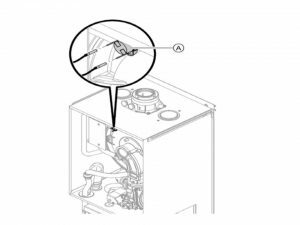 Before starting any work on Viessmann boiler you should be aware working on any gas appliance without having proper qualifications (Gas Safe Registered) is prohibited by law. Electrical work on Viessmann equipment should be carried out by electricians and system should be commissioned by proper system installer or a qualified person authorized by the installer. protect the system against unauthorized re-connection. Attention! 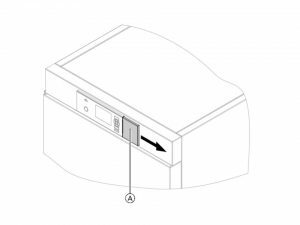 Electronic modules can be damaged by electrostatic discharges. Touch earthed objects, such as heating or water pipes, to discharge static loads. The high limit safety cut-out is part of the boiler. The high limit safety cut-out is located behind the boiler programming unit. Note that any high limit safety cut-out response requires a manual reset. This function gets started only when the flow temperature exceeds 100 °C. On another hand this function can be terminated only once the flow temperature has dropped to minumum 70 °C. activated safety valve is reset. Press the green button on the high limit safety cut out. A quiet “click” will be audible. The high limit safety cut-out has been reset. .Close cover A on the programming unit. The fault code is displayed with OK. Explanations of most codes are present in the tables below.For some faults, the type of fault is also displayed in plain text. Acknowledging a fault Follow the instructions on the display. 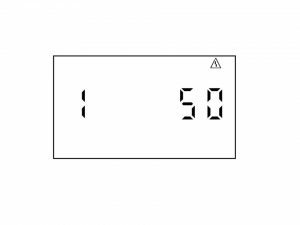 For constant temperature control unit, whenever there is a fault, the red fault indicator A will illuminate on the display and the two digit fault code will be displayed on the programming unit display. The fault code is displayed with OK. Explanations of most codes are present in the tables below.For some faults, the type of fault is also displayed in plain text. Acknowledging a fault Follow the instructions on the display.Example: Fault code “42”. In order to acknowledge fault press OK; the standard display will be shown once more. Wrong calibration of the combustion controller E3 or/and Eb fault on display Ensure adequate heat transfer Press reset button. Verify the gap between ionization electrode and burner gauze assembly. Verify allocation of gas type (coding address 82, gas train setting). Verify flue system, remedy flue gas re-circulation if required. Often faults are wrongly described and therefore determine as issues with burner. Normal burner operation sequence is described below. 4. Pre-purge phase where pre-purge cycle starts within the pre-programmed timing. Pre-purge timing is in addition to previous phase. The fan speed must be greater than 1500 rpm. 10. Post-purge speed test phase where gas valves are closed during this phase. End call for heat. Post-purge occurs during the programmed period. 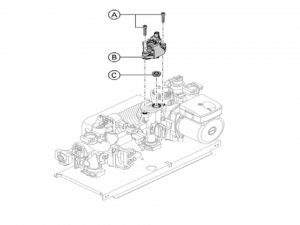 If the fixed high limit trips during normal operation, the blower will purge for 15-20 minutes to cool the heat exchanger. 11. Combination gas valve proof of closure test phase. 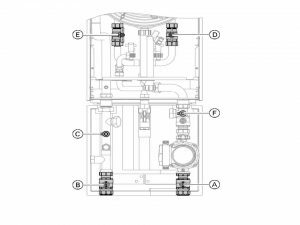 If during the normal operation of the burner a controlled (or uncontrolled) shut-down occurs, a complete mechanical and electrical gas valve proof of closure test will be performed by the flame safeguard. After a successful mechanical and electrical proof of closure test, the flame safeguard will expect that the flame is not present. If, however, the flame existed for a period of >30 seconds, the flame safeguard will go into permanent lock-out. Value of the minimal filling pressure should be written down when starting up the system for the first time. Attention! 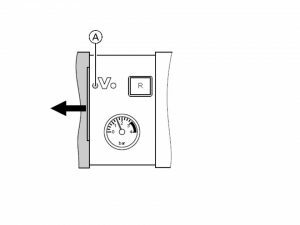 You should pay special attention to low values at the manometer as they often show that there is a leakage in the system. If that is the case, then the leakage needs to be repaired before starting up the boiler. 1. Close shut-off valves A and B. 3. Close shut-off valve D.
5. Vent the first indirect coil through shut-off valve E at mains pressure until no more air noise is audible. 6. Close shut-off valve E and open shut-off valve D.
7. Vent the second indirect coil through shut-off valve D at mains pressure until no more air noise is audible. 8. Close valves C and F. Open shut-off valve E.
Attention! Valves D and E must be re-opened to enable the boiler to operation. 4b. To terminate venting program, press OK or menu buttons. 5a. Press OK and menu together for about 4 seconds, confirm with OK. Whenever the venting program is started, “EL on” on the display is shown. 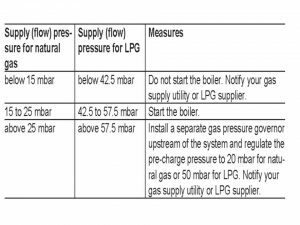 You can yourself check the gas type that is used or that should be used in your Viessmann boiler. Every boiler has a an electronic combustion controller. The purpose of this controller is to set/adjust the burner for optimumal combustion. All this need to happen in accordance with the proper gas quality. For boilers operating with NG no adjustment needed for the whole Wobbe index range. The NG Viessmann boilers can be operated in the Wobbe index range 9.5 to 15.2 kWh/m3 (34.2 to 54.7 MJ/m3). 1. Set adjusting screw A on both gas trains to “2”. 2. Turn ON/OFF switch “8” ON. inside code “11” select value ≠ “9”. 4. Open the gas shut-off valve. The requirement for a tightness test is being held the same for the wall mounted as well as for balanced flue systems. It is being done during commissioning by the flue gas inspector. It is recommended annually to carry out a simple leak/tightness test. The CO2 or O2 concentration tests will need to be carried out in the combustion air at the annular gap of the balanced flue pipe. The flue pipe is deemed to be gas-tight if the CO2 concentration in the combustion air is either bigger than 20.6 % or lower than 0.2%. Whenever O2 values are lower and/or CO2 values are higher pressure test will be started. Test will run with the flue pipe with a 200 Pa pressure (static). 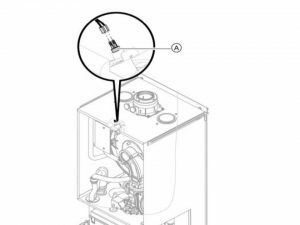 Most Viessmann boiler models have built-in automatic frost protection function. This function allows the boiler to be shut off for an extended period of time while protecting it against freeze-up. Frost protection is non stop active function. The burner is turned on whenever temperature in the boiler is equal or lower than 5ºC. This function will switch itself off once temperature in boiler water gets close to 15ºC, and not more than 20ºC. 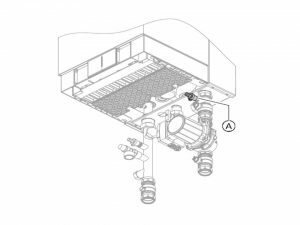 Before starting any repair work on Viessmann boilers remember that components which fullfil a safety function can compromise the safe operation of existing heating system. 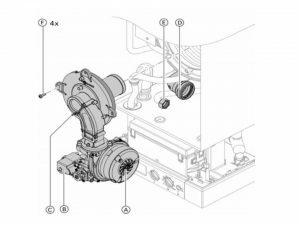 Therefore replace bad components only with original Viessmann spare parts. 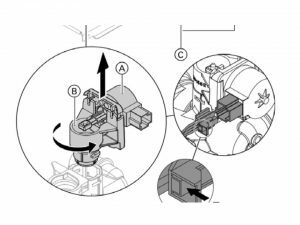 Pay attention that the spare and wearing parts which have not been tested together with the heating system can damage or readjust its function. Installing non-authorized components and non-approved modifications/conversion (including software coding changes) can damage and readjust safety and may invalidate our warranty. 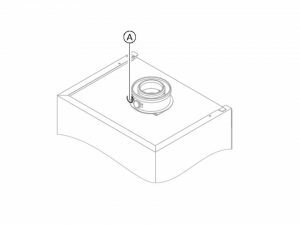 For replacements, use only original spare parts from Viessmann or those which are approved by Viessmann. 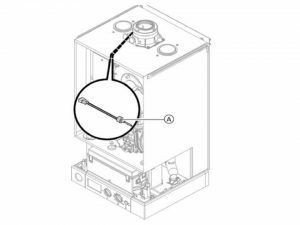 In order to replace any parts of the Viessman boiler you will first need to gain general access. 2. Check fuse F1 T6.3A as described on the picture below. Replacements fuses part number 7815 580. Attention! Breaker or main service switch must be turned off because the on/off boiler switch has no ability of disconnecting power to the boiler or/and pump module. 4. Remove the cap B. and the faulty flow limiter C.
7. Insert new flow regulator C.
Attention! 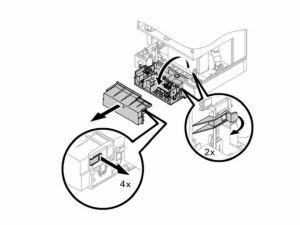 Verifying Fixed high limit functionality should be done in each instance when burner unit control cannot be restarted after a shutdown because of fault repair. this includes the instances when the water boiler is below 95°C. call your gas supplier from a neighbor’s phone immidiately and then follow the gas supplier’s instructions.